In order to maintain proper inventory accuracy, you’ll need to run the occasional cycle count. 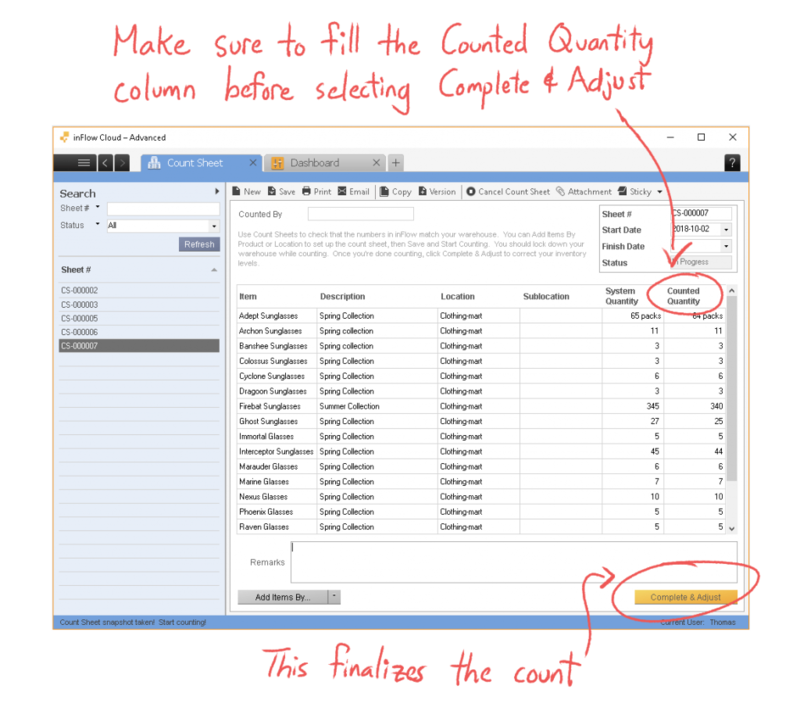 We’ve covered this procedure on the inFlow blog before, but those instructions were for using an Excel count sheet template. In this article we’ll show you how we recommend completing a cycle count with inFlow Cloud. Even on a perpetual inventory system, there are a lot of things that can happen to your stock levels. Stuff can break inside of your warehouse, items can get lost while reorganizing, and people can make mistakes while recording quantities. These factors can cause your records to deviate from what’s actually on the shelf. Cycle counts are ways for your business to fight back against the chaos and set the record straight. Just as with our other workflows, you’ll ideally have a few people to help with counting. We suggest having one supervisor on hand to print and complete the count sheets in inFlow. In addition, you should have at least two people to help with counting. This can help to speed the task up, or allow you to double check the counting process. We generally suggest counting overnight with staff on a night shift, or hiring an external team to count your inventory (yep, there are specialists whose job it is to help other businesses count). If you don’t have a team of three, then the supervisor can also do double-time and help with the counting themselves. Once the supervisor makes a decision, the items should be added to the count sheet and then saved. If you aren’t able to complete everything on the count sheets then that’s OK too. inFlow Cloud can split out the counted items and prepare a new count sheet with just the uncounted items from this session. If you’d like to do this, the supervisor should use the Copy button in the action bar and then select Split Count. The most important piece of information here is that no physical inventory movements should take place during a cycle count. Once you start the process of counting, the warehouse should stop order picking, order receiving, and stock transfers. The supervisor should communicate this information to the warehouse teams in advance of the cycle count. 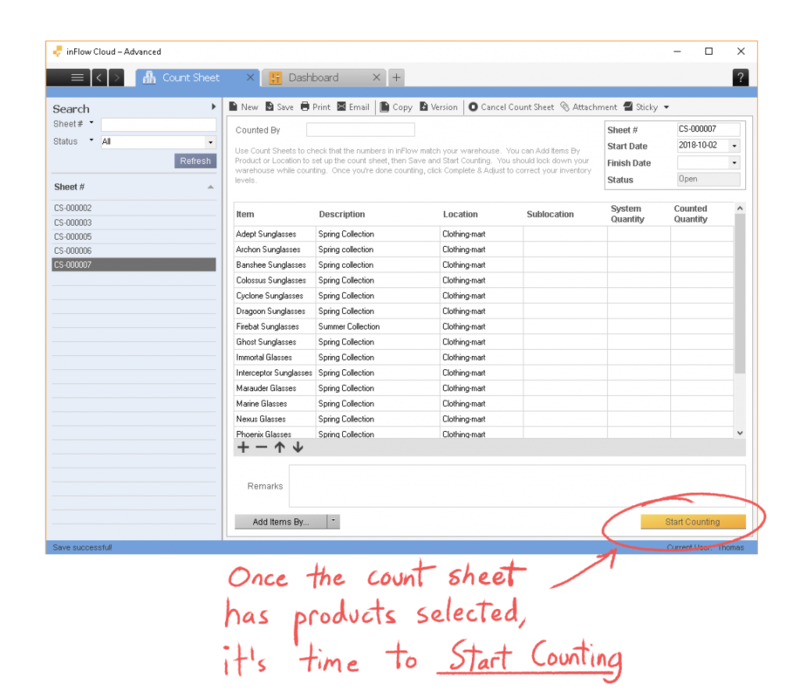 When it’s time to start, the supervisor selects the Start Counting button inside of the count sheet in inFlow Cloud for Windows. Then the supervisor prints two copies of the count sheet; we suggest placing the second copy of the count sheet aside for now. The first counter should take one or two pages, starting from the top of the stack (e.g., the first page). 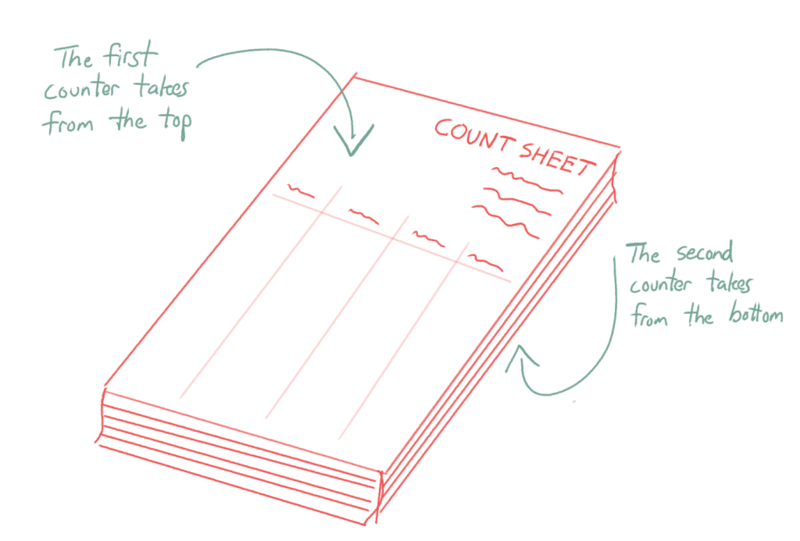 The second counter should also take one or two pages, starting from the back of the stack (e.g., the last page). This guarantees that the pickers don’t start on the same products and get in each other’s way. It also allows you to increase the accuracy of a count by double-checking —more on this later. We recommended starting the count before you print the count sheets so that the System Quantity is displayed on the printout. This gives the counters some idea of how much inventory should be there. We don’t recommend blind counts (no quantities on the printed page) because the counters won’t have any idea if products are missing. Each counter heads to the warehouse with their pages and counts the product. The quantity that they count should be written into the Counted Quantity column. As each page is completed, the counters should bring the completed sheets back to the supervisor and receive new sheets to count (if applicable). When all pages are completed, the supervisor should bring up the second copy of the count sheet. Once this second copy of the count sheet has been completed, the supervisor and counters should review the Counted Quantity column for each item. If there are any discrepancies, these should be resolved by counting those items again. At this point we recommend consolidating the final numbers onto a single copy of the count sheet and treating that as the master version. At this point, the job of the counters is done, and it’s up to the supervisor to enter the Counted Quantity values into inFlow Cloud. If all of the counting was completed in time, the supervisor should just select Complete & Adjust. This will ensure that inFlow’s records reflect exactly what was counted on the warehouse shelves. If there is still counting left to be done, the supervisor should select the Copy button in the action bar and select Split Count sheet by Counted. As described earlier in this article, splitting a count sheet will only apply changes to the counted items. Any leftover items will be automatically copied to a new count sheet, to make it easier to continue next time. After the count is done, the supervisor could also run a Count Sheet Report. The value for Finish Date should be set to the date the count was completed. Group by should be set to None and Sort by should be set to Adjustment Value. This will display a report with the highest discrepancy items at the top, and these were the items that differed the most from inFlow’s records, so it’s good to keep an eye on these to make sure they stay accurate in the future. We hope you’ve found this cycle count workflow useful, and if you have any questions, just let us know in the comments! If you haven’t done a cycle count in a while, this is the perfect time to do so. And if you’re not yet an inFlow Cloud user, you can sign up below for a free trial and get a new count sheet printed today.